Our Methods - To Clicker training and beyond! Here in South Liverpool we’ve been dog training for nearly half a century but the methods we use now are very different thankfully to those used in the 80’s and 90’s. Then, dog training relied on showing your dog who’s boss, physically punishing the wrong choices and … let’s be honest, we’d rather not think about it! Sadly there are still dog training classes that still use these methods! Thankfully as training methods improved and developed we found that the new methods were even more effective and we’re continuing to learn and pass on that benefit to our clients. We are kept fully up to date with the latest training techniques as we are both fully registered professional dog trainers and members of some of the most respected organisations in the dog training world. To give you a brief insight of our training methods. 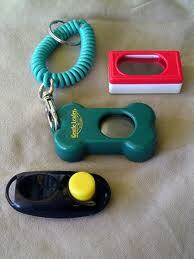 We use clicker training for the older dogs and verbal markers for puppies. It’s all about mutual communication and respect. Modern training methods have shown us that dogs are amazing creatures with fabulous problem-solving abilities. Tapping into those makes life easier and much happier at both ends of the leash. So what is clicker training? A clicker is a training tool. It isn’t magic, like all tools it needs someone to work it properly! These days’ clickers are also used to train all sorts of animals for the film industry; dogs, pigs, horses and rats just to name a few. They are also used in zoos and safari park to get animals used to being handled. Rather than using a tranquiliser dart, a Rhino can be taught to offer one foot at a time to the keeper when a pedicure is required! Come and join us and you will experience for yourself, that training your dog can be fun and easy for all the family; even the children and grand-parents can do it.